The revolutionary Nanolux dimmable digital ballast is a premier choice for your garden. The Nanolux uses cutting edge circuit board technology to make it 1/2 the size of traditional digital ballasts at 1/4 the weight. The Nanolux will operate HPS and MH lamps, and it incorporates a random start feature, which gives each ballast a 0-15 second window upon which it will strike the lamp. This feature allows for a lower initial power draw when using multiple ballasts. In addition, the Nanolux ballast is programmed with a "soft start" and "soft dimming" which helps extend lamp life. 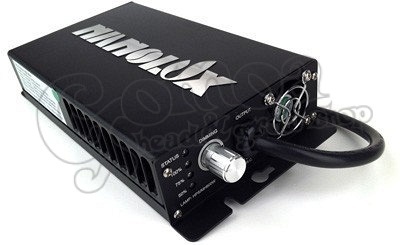 The Nanolux ballasts operate on 100-265 volts and utilize an LED notification system. This indicator allows the user to easily diagnose such problems as fan failure, under or over voltage, short or open circuit protection and thermal overload protection. Customize your light output between 100%, 75% and 50%. The Nanolux ballast comes pre-wired with Hydrofarm's new dual lamp receptacle, which allows you to plug in all common reflectors without the use of an adapter plug. Enhance your garden with the Nanolux dimmable digital ballast today!